Submitted by Mirel on Thu, 2018-11-08 00:56. As requested, i am attaching the maxscript listener output. Submitted by sergo on Mon, 2018-10-15 18:51. 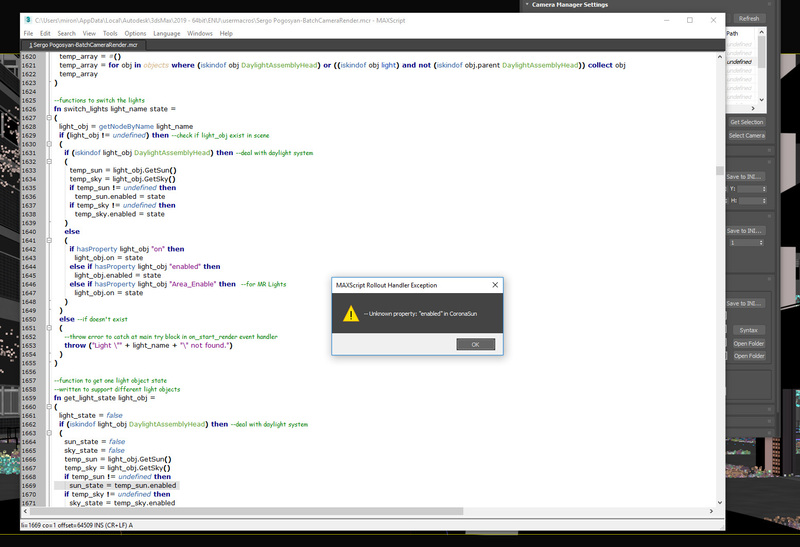 Could you please provide maxscript listener output so I can see where the error happend? Just copy and paste what's shown in red. Or send me a PM so that sensitive information doesn't go public. Submitted by Mirel on Mon, 2018-10-15 02:58. While sending a scene to deadline, if that contains a Daylight system it gives an error regarding an unknown property of the CoronaSun (see attached image). Submitted by m.moraes on Wed, 2018-08-29 12:15. EXR and EXR-IO for Photoshop solved my problem. Thanks ! Submitted by THINKTANK on Fri, 2018-08-24 02:27. I concur I can't get them either, it's a brilliant addition and it honestly completes my pipeline brilliantly we just need to get it to save out the elements individually. I did notice you can do it by getting it to save out a .exr version with the layers saved inside. Submitted by m.moraes on Wed, 2018-08-22 08:09. I can't generate render elements using vray and deadline. Am I missing something? Submitted by mali on Tue, 2018-07-03 06:20. It's pretty much random, I don't know how to reproduce it. Sometimes it fails at the first camera, sometimes at any other... I'm not sure when this started, maybe it's due to a windows update? I usually restart max to make it work again. Submitted by MyGalaxy on Fri, 2018-06-22 05:21. It's bad that the frame range with negative numbers is not supported. For example, I need to render from -30 to 30 frames. How to do it? Submitted by JuanDAO on Sat, 2018-06-09 10:42. But there is a problem with GAMMA settings when using CORONA render. Looks like gamma overrides to 1 (must be 2.2) when render with this script. This happen's when used corona converter. Пожалуйста, предложите решение проблем с ГАММОЙ при рендере КОРОНОЙ. Submitted by uMandef on Wed, 2018-05-30 10:18.
first of all thank you for this amazing script and for the continuous updates! I'm writing here to ask you how to save render elements with a different file type than the one of the main render: if I save the file in .exr I cannot find the way to save render elements in .jpg (as they are set in render setup - render lements) as it saves in .exr them too. Am I missing something or isn't it possible?